Argentina’s Senate approved a government-backed bill that puts new limits on television and radio ownership and will probably force Grupo Clarin SA, the country’s biggest media company, to sell off assets. The Senate handed President Cristina Fernandez de Kirchner a victory, passing 44-24 a law she said will “democratize” the airwaves. After a session lasting almost 20 hours, senators approved the 164 articles of the bill without change. The central provision of the law limits ownership of cable and broadcast operations in a single market. In pushing the bill, Fernandez said Clarin holds 73 percent of Argentina’s radio, television and cable licenses. 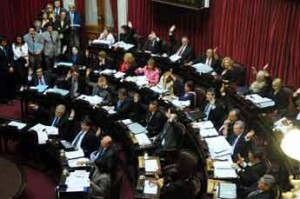 Critics of the bill, such as Senator Luis Petcoff Naidenoff of the Radical Civic Union party, said its aim was in fact to “silence voices” of dissent after Fernandez and her husband, former President Nestor Kirchner, began accusing Clarin of bias in covering their policies. Daniel Vila, president of closely held Uno Medios, a media company based in the western province of Mendoza, said Sept. 24 the bill amounted to “indirect expropriation” and would lead to lawsuits if companies are forced to sell licenses. Fernandez rushed the bill through, before the new congress, which she won’t control, takes office in December. Clarín reports that the law was approved without any of the ammends suggested by the opposition, and that the law was designed to affect Grupo Clarín the hardest, in preparation for the 2011 electoral campaign when Fernandez is seeking re-election. The government’s bill would likely lead Clarin to sell broadcasting and programming units such as Canal 13, analyst Alexandre Garcia of Raymond James Financial Inc. said in a Sept. 17 report. That would leave the company with its subscription TV and broadband operations, which Garcia said generate two-thirds of Clarin’s earnings before interest, taxes, depreciation and amortization. The group’s Canal 13 television station accounts for a market-leading 44 percent share of TV advertising, according to the company’s Web site. It also owns radio stations, 13 cable and broadcast TV networks, and Internet companies. The signs indicate that darkness will first descend on regions, such as South America, that have never stood fully in the light. I wonder in what corners of the world will civilization find refuge. Come on!!!! Even the UN observer did support the law!!! They replaced an old law from the dictatorship with a new modern one who will garuantee that the private, public and NGO sectors will all have entrance to the mass media.